They were sleepless nights…mind racing…wondering…guessing…”something just isn’t right”. I started seeing signs when he was 5 months old. He wasn’t able to sit up and I knew something was wrong. No one listened to me. My motherly instinct kicked in over drive and I was determined to get answers! I searched every site and read every possible book. My mind wouldn’t accept reality. This is my little baby boy. The one we had waited so patiently for and now we’re lost. As our little boy showed absolute happiness, it was grieving we couldn’t help hiding. Linden was diagnosed with Hypotonia and Esotropia September of 2011. He was two months’ shy of his first birthday. The emotions that filled my heart and mind were excruciating and overwhelming. The guilt took over me and for months I was a walking mess. When we weren’t at doctor appointments or evaluations, I was researching. Our little guy never once showed fear or the drive to stop try. He never saw was we saw. Honestly, his perspective of reality was something I realized I needed to see also. Hypotonia is the weakness of muscles. Linden was what we called a frog. He was so flexible and it was odd. He had no balance nor the ability to control his movements. He was in complete helpless mode when most babies were learning to scoot on the floor or crawl. Esotropia is crossing of the eyes. We detected it one day while he was sitting in his highchair across the room and our eyes met at each others same level. His left eye turned in slightly. We soon learned of his diagnosis and were informed that, additionally, he had no upper field of vision. He could only see what was directly in front and below of him. At this point we weren’t sure we could handle anything else for a bit. Linden’s ophthalmologist ordered a MRI just to be safe. From there is when we found the most disturbing news yet…our baby had a stroke while in utero. His neurologist said that from the size and shades, it looked to of happened within the first trimester. Devastating! 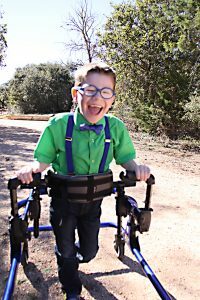 From the MRI findings and further testing, Linden was formally diagnosed with Cerebral Palsy when he was 16 months old. I remember the moment his neurologist said it. My response “but it’s not that really, right?” I thought she was just giving us an example of what could of happened from the stroke. 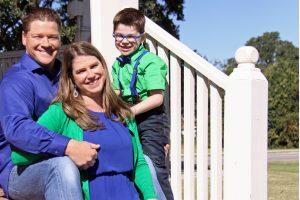 My mind refused to accepted and believe that our baby boy has Cerebral Palsy. From the moment of Linden’s first diagnosis we sought out services. We needed guidance and direction. We were connected with a very knowledgeable and trustworthy Early Childhood Intervention (ECI) case worker. She held our hands through the entire process and connected us to great people in the community. We are so grateful for her. We also started services at a therapy center for physical therapy. This is when we stumbled along an amazing, kindhearted and giving soul. On many occasions she was my shoulder that I cried on. She set up support groups for me, helped with mine and my husband’s grieving and provided Linden with the most amazing treatment. We are forever grateful for her and cherish our friendship. We’re blessed to still have her in our lives today. Linden’s diagnosis journey continued as he became sick. He was a kid that would get sick often and I mean often. Each month he was severely sick with lung issues. He was finally diagnosed with asthma and seasonal allergies. We have quite a few regimens daily to help prevent these episodes. Linden also bruises quite easily on his spine. This lead us to a blood doctor which is when he was diagnosed with Factor V Leiden. This is a genetic blood clot disorder. Doctors speculate that this caused his in utero stroke. Around this time, we started to notice Linden’s lack of communication. He knew a few signs and could say only 2 to 3 words. His frustration in himself not being able to express himself was killing us inside. We wish we could flip a switch and make things better. We signed him up for speech services. This took a bit to see results. Fortunately, when Linden became 3 years old our local school district started providing half day services. He had wonderful teachers and therapists; proving that starting early education is extremely beneficial. It took a bit before we started seeing progress but when we did he flourished. We continuously pushed him and his potential. We knew he could do more and we weren’t giving up. He has since started kindergarten and his education team is unbelievable. Their commitment to his progress and improvement show every day. Within weeks of school he was singing songs and counting. He was writing his name and drawing tangible things. He has grown so much and is a completely different kid. He crawls, talks, sings, walks (gait trainer), swims, holds conversations, does basic math. My kid! My kid! Linden’s fearless attitude and abundant motivation are what kept my husband and I hopeful. We dreamed of his life and how it might turn out. Who would be his friends, what school will he go to, will he go to college, will he be able to live alone one day…I will say that perhaps these types of questions may not need definitive answers just yet. We learned from Linden’s thriving personality that it’s not where you go right now but how you get there. We keep providing him with opportunities for independence and growth, to better himself, and quite honestly to better ourselves. Our journey is far from ending, it’s only beginning. Each day brings new challenges but also new accomplishments. We’re proud to be Linden’s parents and are excited to see where life takes us.